Proceed to Other Issues and Injuries. Return to Criminalistics Laboratory Methods. Degressive (regressive) burning: gunpowder grains formed in flakes, balls, and sticks have a burning surface area that decreases continuously as the grains are consumed. Neutral burning: gunpowder grains that are single perforated and the burning surface area remains relatively constant. Progressive burning: gunpowder grains that are multiperforated and rosettes that have a burning surface area that increases continuously as the grains are consumed. Firing a weapon produces combustion of both the primer and powder of the cartridge. The residue of the combustion products, called gunshot residue (GSR), can consist of both burned and unburned primer or powder components, combined with additional residues from the surface of the bullet, surface of the cartridge case, and lubricants used on the firearm. Residues can be either inorganic or organic in nature. The cartridge case, bullet, bullet coating, and metal jacket also contain specific elements that can be detected. Virtually all cartridge cases are made of brass (70% copper and 30% zinc). A few have a nickel coating. Primer cases are of similar composition (Cu-Zn). Bullet cores are most often lead and antimony, with a very few having a ferrous alloy core. Bullet jackets are usually brass (90% copper with 10% zinc), but some are a ferrous alloy and some are aluminum. Some bullet coatings may also contain nickel. (Ravreby, 1982). 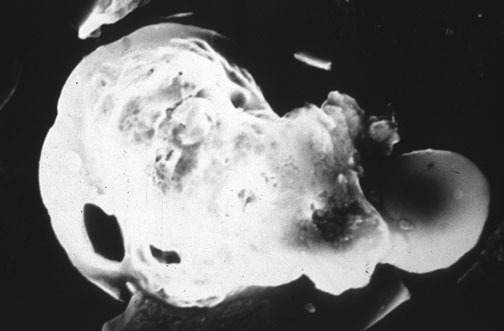 SEM may also have usefulness for examination of bullets, as embedded materials from the target such as bone fragments may aid in reconstruction of the scene (DiMaio VJ et al, 1987). SEM has been used to study tool marks made by the firing pin impressions in the primers of spent cartridges. Such findings could be useful to determine which gun was used to fire the cartridge. Grove et al (1972) found that SEM could reveal clearly all surface detail in the impression and that 50% of shotgun impressions and 75% of rifle impressions could be positively identified on the basis of four or more individual characteristics, given similar class characteristics. Residue is lacking in entrance wounds with airguns (Denton et al, 2006) (Cohle et al, 1987). 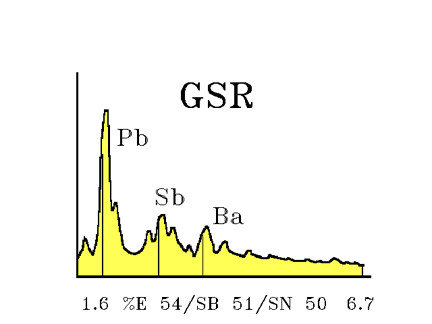 The alizarin red S stain can be utilized in microscopic tissue sections to determine the presence of barium as part of GSR (Tschirhart, Noguchi, Klatt, 1991). It may be difficult to both find and determine the nature of gunshot wounds in a decomposed body. Determination of the range may be particularly difficult. Extreme care should be taken to avoid misinterpretation of the wounds and artefacts. Gas chromatography has been used to identify gun oils in targets, and was very sensitive, even with stored specimens (Kijewski and Jakel, 1986).